Standing in front of the line of riot cops was another line of middle-aged men. They were there, one man said, to provide a buffer between the police and the congregated citizens. “If there was no buffer, the situation could escalate like it did yesterday,” one man said. “Yesterday was a day for the community’s voice to be heard,” he said when I remarked that the difference between last night and tonight was astounding. Share this inspiring image using the social media buttons below. The image itself…speaks. It only says affirming things. It’s very moving. Thank you to every man who stood with the police and military, taking a stand for what is good and right. I do not live in your area, but am proud that men would stand up like you men are. Men and women who think like you are in the majority. It has just taken a few to cause and create the trouble, and then it escalated to a few more. Probably, as in other cases, even in our area a few years ago, outsiders came to the area to cause trouble, loot and steal. 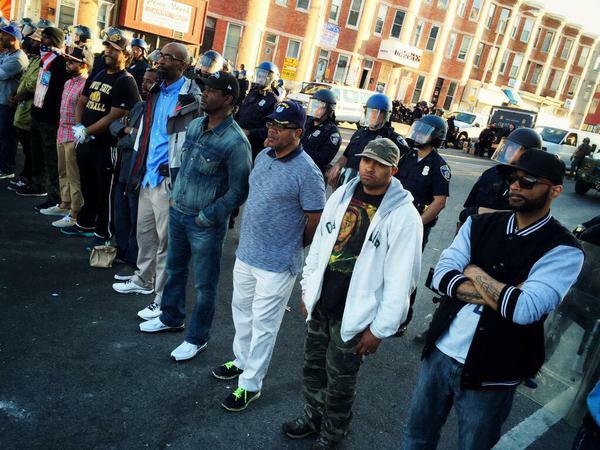 Stand firm, STRONG MEN OF BALTIMORE. Continue to show how true men act. God’s Blessings and Protection to all. They are the real men! Many people in this world provide many moments that are frustrating and sad but for every sad story if you look for it you will find good people trying to do the right thing for others. Peace to everyone today. ….. and this is what the MEDIA has failed to show!! Because it doesn’t sell!! Here’s to shattering prejudice and preconceptions. Most people–color no matter–are kind and would not want violence unto anyone. Good to know. I missed that on TV.